In Catania, Sicily breakfast is granita (Italian ice), brioche and cappuccino. The meal structure in Italy is a little different than it is in the US. The big meal of the day is comprised several courses. In Italy, the typical Italian breakfast consists of a small pastry and either an espresso or a cappuccino. We ate a lot of yummy breakfasts when we were in Sicily in July. The big meal is the pranzo or dinner which is served at the noon hour. The last meal of the day, cena, or supper, is a much lighter dish. The appetizer course is composed of cold dishes such as cold cuts such as salami, prosciutto, mortadella etc., or roasted vegetable such as grilled eggplant or roasted red peppers. Some restaurants have so many yummy antipasti that people will often sub the antipasto bar for the first course. This course includes pasta, soup or a risotto dish. All the recipes I’ve shared so far have been primi piatti. The second course is the most important course and consists of meat, such as chicken, beef, pork, rabbit or wild game or fish or shellfish. Side dishes are not served on the same plate as the second course but alongside it in a separate dish. Choices are either a simple green salad (lettuce only) or a mixed salad (lettuce and tomato) or some other kind of veggie, often patatine fritte (french fries). The dessert course can be something light, like a sorbet, or something much richer like a coppa di gelato (ice cream sundae) pastry or tiramisu. Keep in mind that each region has its own specialties. For example cannoli is a Sicilian pastry. Nowadays you can find them in other regions but it’s really a Sicilian thing. These courses are preceded by the aperitivo, an aperitif, and followed by a caffe and digestivo, such as limoncello. Here is a recipe for one of my favorite antipasto. Mix all ingredients together in a small bowl and let sit. In the meantime slice ciabatta bread (or other artisan bread) into half inch slices then toast in the oven set on 425 degrees on a cookie sheet for 8 minutes, turning after 4 minutes. Alternatively, grill on gas grill. When bread is toasted, rub each piece with a cut piece of garlic When ready to serve, spoon tomato mixture onto bread. Drizzle with more olive oil if needed. The Italian breakfast looks yummy! 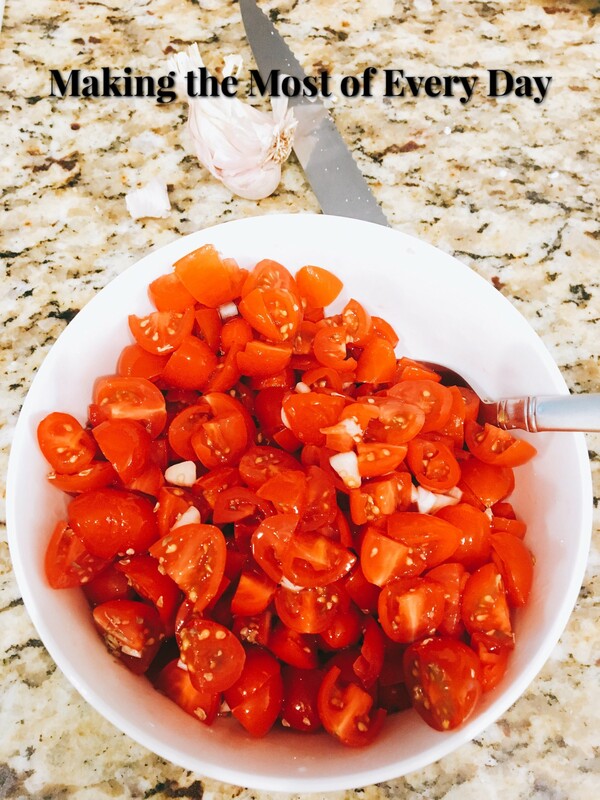 🙂 I also enjoy Bruschetta and that recipe was a good reminder that I should make it while I have all the fresh tomatoes from our garden. 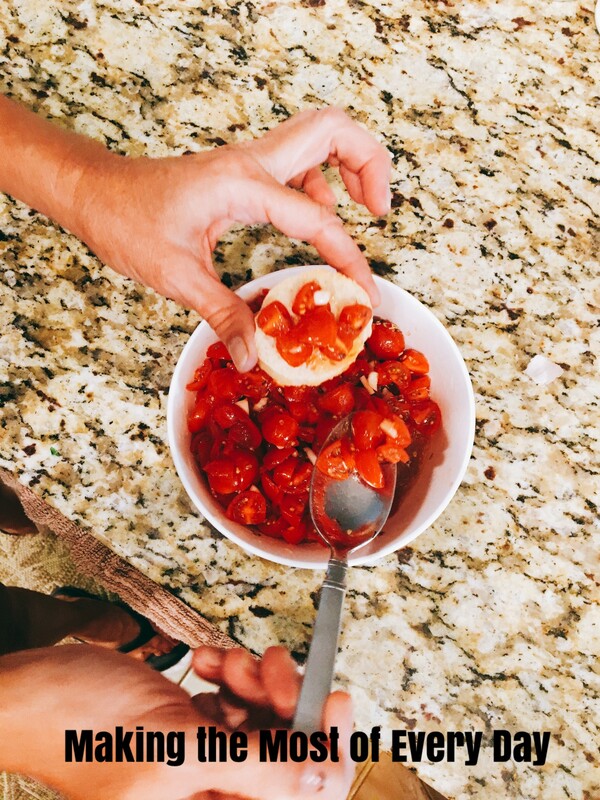 The BEST bruschetta is with tomatoes-from-the-garden! Do the Italians have a siesta mid-afternoon? In Panama, the shops and everything else, closed up for two hours in the afternoon so that everyone could go home for lunch. I am thinking maybe in Italy it is the same so that everyone can enjoy the larger, heartier meal of the day at noon(ish). How interesting that French fries are a side dish. Here in El Paso, many of the Mexican restaurants serve baked potatoes with a meal…so you would have beans, rice, the main dish and baked potato! Oh, to be able to eat that way with no consequences. Yes, most stores and offices close midday however with westernization that is changing. I grew up in a small southern town and the kids would even go home from school for lunch and then return. I’m not sure if they still do that. I’ll have to ask mom. Shops would open at 10:00, close at 1:00 reopen at 4:00 and close at 8:00. That is so interesting about the different courses. I like the notion of having an excuse to sit around the table talking and laughing. That’s really interesting about the shop schedule, too. When I was a little kid, I just wanted to go play. Eat and run. But as I got older I would linger, listening in to the adults’ stories.